Cheat Day does not refer to a diet where you indulge in your favorite comfort food, it means something different. If your husband is cheating maybe you will settle for comfort food or do something about it, either way it’s cheat day right? The Day before Valentines Day, unfortunately, is cheat day. I say this because it’s the day where cheating husbands play in both worlds of family life and life away from the spouse. The Urban dictionary defines it as Mistress Day. Married men know that on February 14th, they had better to be making an effort to have a preplanned night out with their wife. It has become an expectation, and uneasy day to the husband who ignores the holiday. However, for the man who has a little, something on the side, she is often unhappy and jealous of the fact that she is not going to get attention on this day. So to set the mistress at ease these men try to make the other woman happy by spending the evening before Valentine’s Day with her. No one likes to think about their spouse cheating on them. Nevertheless, if your spouse is cheating, the arrival of Valentine’s Day is one holiday that is hard for cheating lovers to overlook. While Valentine’s Day itself is reserved for your husband, wife, or significant other, the day before, February 13, can easily be set aside for the “other” person! So fellow wives if you get the “I have to work late excuse the day before Valentine’s day, and you have noticed skeptical behavior in the past few weeks, you might consider if your spouse is indulging in cheat day and expecting to have is cake too, check the credit card statements for inconsistencies or the bank account for irregular large cash withdrawals. Alternatively, you can call me, and I can run surveillance for you at anytime. Cheating happens all the time not only on the Day before Valentines. If you want to catch him in the act, please fill out the form below, and I will contact you. In that same society how can there be an estimated 40,000 unidentified dead throughout the US? If we accept the premise that the majority, if not all, of these unidentified deceased were reported missing somewhere, we must ask why haven’t these cases (the unidentified and the missing) been linked together? Where is the missing link between them? The Apogean Group is proud to say we have a 100% record when it comes to missing persons, and the point of this post isn’t to lecture investigators, It is, however, my intention to share with the professional investigator my perspective. The fact is that the vast majority of missing person’s Investigations resolve themselves by the return of the missing person, through minimal help by law enforcement (Law Enforcement Professionals are over worked with limited resources for Missing Person’s Investigations). This fact is both a blessing and a curse, for it leaves many misguided personnel to invest little or no time into the basics of the investigative process, counting on the missing person’s return. This has had, and will continue to have, dire consequences for the true at-risk missing person’s Investigation cases and the missing person’s family. Fingerprints, dental records, and DNA! These are the critical minimum records that must be submitted into law enforcement’s searchable databases. These are the missing links. There are several factors that make missing person’s investigations a challenge, but there are a few guidelines I go by to ensure success of each and every case. Due to the nature of the content it’s my bread and butter so I do not want to divulge all of my secrets; however I will share one; a close examination of routine, can give you a lot of insight into why a person goes missing. Just recently you may of heard of a missing person’s investigation in Plano Texas. Within two days after careful examination combined with ability I found the missing person in under 2 days. I am not tooting my own horn here, rather trying to prove a point about someone’s routine, in this case it was a major factor. Experts explain that a substantial portion of how we communicate is nonverbal. 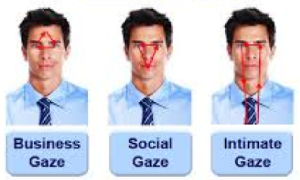 Each and every day we respond to hundreds if not thousands of cues and behaviors which include postures, facial expression, eye movements, gestures and tone of voice. Investigation depends on being able to read these nonverbal gestures as well as how you dress, shake a hand. These nonverbal gestures give off details and reveal who we are and really impact how we relate to other folks. 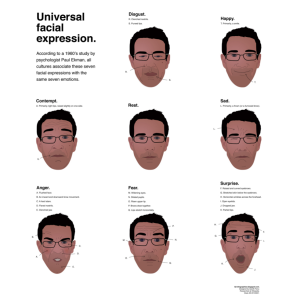 Science research on nonverbal communication began with the 1872 writings and publications of Charles Darwin’s The Expression of of the Emotions in Man and Animals. Obviously since that time there has been abundance of research on the types, effects and expressions of unspoken communications and behavior. 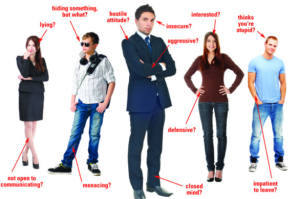 Nonverbal communication signals are so subtle that every day people are not consciously aware of them. 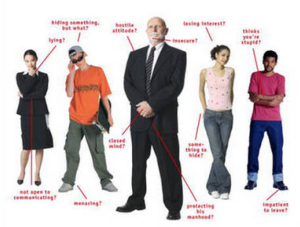 There are several different types of nonverbal communication as it relates to investigative work. 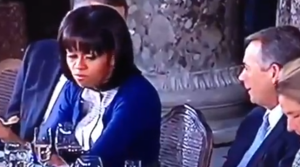 In the image below Michelle Obama showing a clear and classic nonverbal display of contempt towards Mr. Boehner. Note the left unilateral snarl with mid face tension, her left lip curling up, Although her eyes look in the direction of the Speaker , her head barely turns toward him. Communicating through touch is another important nonverbal behavior. There has been a substantial amount of research on the importance of touch in infancy and early childhood. Harry Harlow’s classic monkey study demonstrated how the deprivation of touch and contact impedes development. Baby monkeys raised by wire mothers experienced permanent deficits in behavior and social interaction. Touch can be used to communicate affection, familiarity, sympathy and other emotions. There is also another side to this. In investigations It is important to realize that within the structure of rapport-based direct questioning, the object is to help the person become comfortable. The proper use of proximal (physical proximity) and haptic (physical contact) techniques reduces psychological barriers and improves rapport. In Summary Nonverbal communications is just as important in private investigations to get the bigger picture. Marriage or relationships are not easy, things happen, people change or get wrapped up in careers, adult children or a combination of factors occurs, surfacing the just cause of the split. One of those factors infidelity is an affair –the man; usually admits to having an affair. In an article Why Long-Married Couples Split by AARP it outlines high profile marriages and why they last or don’t last. As suggested in the article high-profile cases of infidelity usually grasp the headlines, but more often than none, it is only the factors infidelity that brings the real problems bubbling to the surface. In a survey conducted by AARP on the sexuality of people 45 and older found that the affairs happen for only a relatively small number of couples. It may be a reason, but it is not the root of some marriages failing. The question remains why so many long-married couples decide to split? In most cases, the reasons are far less dramatic but the catalyst; infidelity gets the blame. The above are some of the real reasons and “The Factors Infidelity” Helped it along. We have all bought balloons for someone’s birthday at one time, or another brought them home. We tie them to a chair or the back of the child’s bed. Over a day or so you notice the balloon starting to lose its lift. Compare this to a marriage, the helium being an element that holds the marriage afloat. If the marriage has holes like a porous balloon then the part that keeps the marriage afloat, starts to leak, and the binding element begins to diminish. At one time or another we always ask the question “What happened” most likely you hear the statement “We grew apart” Although it is a standard cliche it does not mean it is not the common cause of the divorce or separation among long-time married couples. 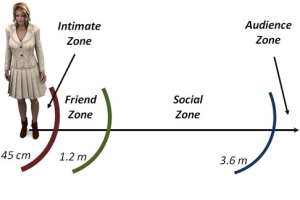 A sure tail sign of a couple losing helium in the balloon of their relationship is the couple leading separate lives. i.e., –he gets more and more into his work -she gets more and more into her children, her adult children, or gets ambitious. Although the Catalyst of Infidelity might have awoken the real reasons, it is probably a good idea to try to understand the real reasons why couples get divorced. It is not an open discussion from any angle but if you feel your spouse is stepping outside the vows, and you are in harms way because of it. It might be a good idea to leave a message. It is confidential, and we understand it is not an easy subject. The Apogean Team provides a no cost preliminary consultation on the subject. If you’re going to go on vacation don’t tell everyone in the world you’re going. People don’t often think about it but telling complete strangers you’re heading out of town through casual conversation happens all the time. Most people when they are going on vacation might mention it to people they have never met before, for instance, telling the cashier when she asked you ” Have any big plans?” “Yep we are going on vacation, and you don’t know them from Adam. Shaw says, “thieves deploy informants everywhere.” In fact, some of Shaw’s best tipsters were carpet installers, hairstylists and bank workers. “These folks were often told about a customer’s upcoming trip and gave us the details, making it very easy to plan our ‘visit’ to the house,” he says. Ever drive by a house and see the famous security sign sticking out in the flowerbed, of course you have. People don’t think about sticking that sign in the backyard. Where do you think most thieves enter from? They don’t enter through the front door; that’s too obvious. Post some other signs saying this house is protected by video surveillance, or sensors. This is a thief’s worst nightmare, the last thing they want is to be caught on camera. A Thief will think twice about entering your house if he/she sees this. If you at home activate your alarm, especially when you retire during the night. To Shaw, 90 percent of the homes he robbed between 1969 and 1980 had alarms that were not on with people inside the house. Don’t ever under estimate a thief’s timing, just because it’s daylight out doesn’t mean they won’t burglarize your home. Think about it for a second; husband is at work; the kids are at school or the wife is holding a second job or running kids around or at the supermarket. A True fact more and more thieves are pulling off daytime jobs than ever before Residential Crime Statistics. Fix your doorbell, most experienced thieves will ring the doorbell to see if anyone is home. If it’s broken you can’t hear or tell if there is thief posing as a solicitor at your door. Junkies looking for a quick fix will often apply for a solicitor’s license just to case a neighborhood to see who’s home and who isn’t. An empty house is an inviting one to a burglar. As a dog owner, I do not discourage barking, because my small 15-pound dog tells me when there is someone around that shouldn’t be. I don’t care if it’s the local bug’s bunny looking for a carrot, I want to know when something or someone is around my house. People that have guests to the door are definitely greeted by an annoying high pitch bark and even when I feel it’s safe to let them in the dog continues to bark until she feels that person isn’t a threat. So guess what room a thief hits first? The master bedroom, if you’re going to keep things safe, it’s best to keep them in the kitchen. It’s the last place a thief will look because it’s usually at the back of the house or middle of the house. The number-one concern; besides being caught? Is the time it takes him to get in and out! When you throw the trash away be careful what you reveal in the middle of the Alley, things like flat screen boxes, computer boxes, etc….. are things that let a thief know what you have in your house. Just as an Identity thief would go through your trash to get relevant information, a house burglar will go through your trash to see what you have in your house. Take a box cutter and slice those boxes into tiny pieces and put them in a trash bag and make sure you shred junk mail .. it’s an Identity thief’s gold mind. If you are going to go on vacation, don’t tell everyone in the world you are going. People do not often think about it but telling complete strangers you are heading out of town through casual conversation happens all the time. Most people when they are going on vacation might mention it to people they had never met before, for instance, telling the cashier when she asked you ” Have any big plans?” “Yep we are going on vacation, and you do not know them from Adam. Shaw says, “thieves deploy informants everywhere.” In fact, some of Shaw’s best tipsters were carpet installers, hairstylists, and bank workers. “These folks for a sum of money told us about the upcoming trip and gave us the details, making it very easy to plan our ‘visit’ to the house,” he says. Ever drive by a house and see the famous security sign sticking out in the flowerbed, of course, you have. People do not think about holding that sign in the backyard. Most thieves enter a residence from the back door. They do not come through the front door; that is too obvious. Posting signs that display “Protection by video surveillance or sensors”. This is a thief’s worst nightmare, the last thing they want is to do is end up on the six o’clock news on camera. A Thief will think twice about entering your house if he/she sees this. If you are home, activate your alarm, especially when you retire for the night. To Shaw, 90 percent of the homes he robbed between 1969 and 1980 had alarms that were not on with people inside the house. Don’t ever underestimate a thief’s timing, daylight does not stop a fox from entering a hen house. Think about it for a second; husband is at work; the kids are at school, or the wife is holding a second job or running kids around or at the supermarket. A fact more and more thieves are pulling off daytime jobs than ever before Residential Crime Statistics. Fix your doorbell, most experienced thieves will ring the doorbell to see if anyone is home. A broken doorbell, you have no warning whatsoever, unless you have a small dog who barks at the drop of a hat. Junkies looking for a quick fix will often apply for a solicitor’s license just to scope out the neighborhood; to see who’s home and who isn’t. Watch for people distributing flyers, I had one walk in the front door, now luckily, I had a female dog meaner than snake standing there just growling, it caught my attention. An empty house is an intriguing offer to a burglar. As a dog owner, I do not discourage barking, because my small 15-pound dog tells me when there is someone around that should not be. I do not care if it is the resident rabbit hopping through the yard; I want to know when something or someone is around my house. Even people or guests you know will look forward to that annoying high pitch bark and even when I feel it is safe to let them in, the dog continues to bark until she feels that person is not a threat. Dogs are a good judge of character. Contract workers in the neighborhood. Don’t be afraid to approach an unknown visitor and ask them what they are doing in the area. Collect those piled up newspapers and catalogs off the front porch, don’t leave them out on the front step; that is a beacon to let a thief know you are not at home. Beforehand, make arrangements with a neighbor to collect them and buy yourself timers for your interior/exterior lights, and TV. Come to think of it, purchase a timer for your master bedroom lights and TV as well. If a fox has the chance your chickens will come up missing. Mitigate risk and .. remember these valuable tips and your house will be less of a target to a thief. If you would like helpful tips on the matter contact this group. I have worked with them in the past they are very professional. Having issues and need help contact us.